A little exercise with triplets and eighth-notes. The idea is to play this polyrhythm of 3 over 2, and 2 over 3, but keep swapping the rhythms between the hands. 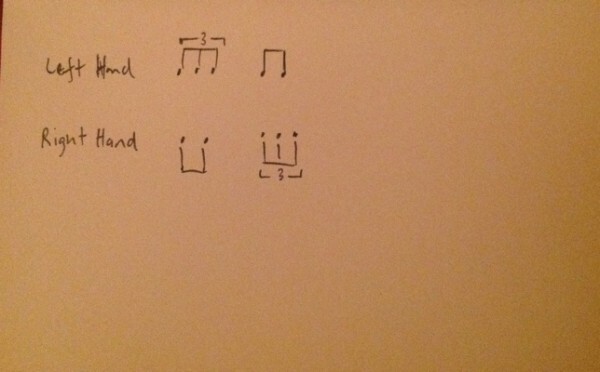 If you’re tapping the rhythms on one surface, then the overall rhythmic sound will be the same when you switch hands. Feel the rhythm two ways. 1, with the eighth-notes as being the pulse. 2, with the triplets as being the pulse. When you hear the polyrhythm as one sound you can learn it as that sound. You might try saying, ‘nice cup of tea’ to the rhythm. If you’ve no idea what I’m on about there, sorry! Have a gander through the archives of Uncle YouTube; perhaps he’ll have something to say about that. Anyway, if you do know what I’m on about, then say, ‘right cup of tea, left cup of tea’, when you switch hands. Or, ‘right funny men, left funny men’. Now, ‘right to hell, you bugger, left to hell, you bugger’. You might think this doesn’t apply practically, but you’d be massively wrong. I can think of several occasions I’ve thought ‘three funny men’ and ‘go to hell, you bugger’ whilst playing actual music.